This Hotshots board game review is based on a total of seven plays. 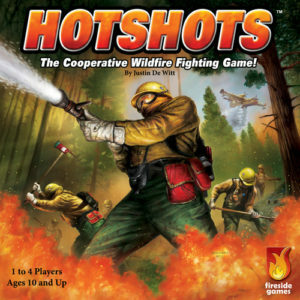 Hotshots is a cooperative press your luck game in which you and your teammates are attempting to put out a wildfire before it scorches too much of the land. Hotshots was designed by Justin De Witt and published by Fireside Games. 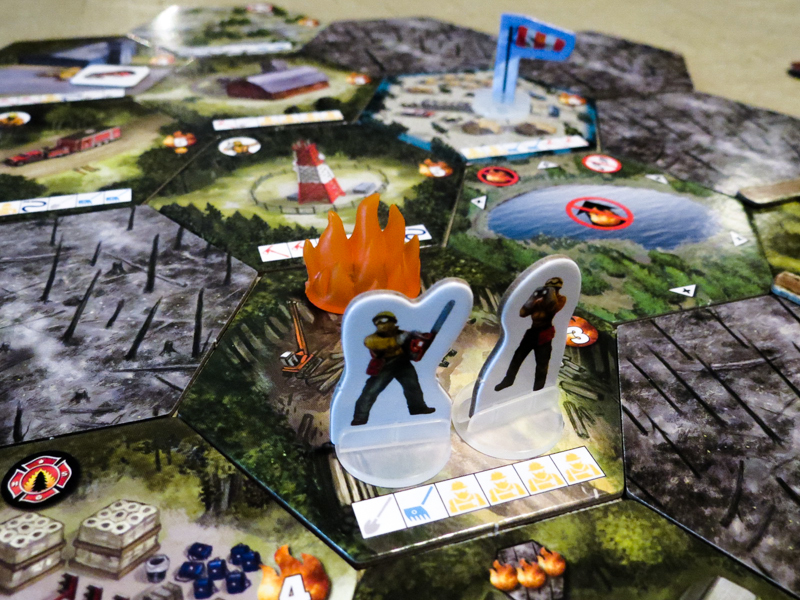 To begin a game of Hotshots, you’ll choose characters, randomly set up the terrain tiles, and then put fire tokens on all of the tiles with the “starting fire” symbol. There is a standard terrain tile layout that you will use for most games, but you also have the option of using one of the six alternate layouts found in the back of the rulebook. On most turns you will be doing three things: moving, putting out fires, and drawing a fire card. Once you understand how these three things work, you’re pretty much ready to play. Movement is really simple. In most cases you will be able to move two tiles away from your starting position. However, you’ll have to stop if you are on a tile with fire, and the Rocky Terrain tile requires both of your movement points when entering or leaving. After you’ve moved, you’ll roll dice to attempt to put out the fire on your tile. You’re trying to match as many of the symbols on your dice to those found on the tile to remove as much of the fire as you can and to get other bonuses. As long as you match one symbol on a roll, you can roll again. However, if you press your luck and fail to match a symbol, your turn will immediately end and you’ll have to add a new flame token to the tile, potentially causing even more problems. There are a number of ways to get support, which allows you to ignore failed dice rolls. The Lake tile gives support to all adjacent tiles. You can also get one support for each other firefighter on your tile. The last way to get support is by using the reward token that gives you one support. The more symbols your match on your dice rolls, the better the rewards you’ll get. Three matches gets you a firebreak, which is placed between tiles to slow the spread of the fire. Four matches allows you to remove one flame token. Five matches removes two flames and you can choose between getting a reward token or getting a firebreak. Finally, six matches allows you to remove three flames and you’ll get a firebreak and a reward token. Every reward token in the game is different, from giving you an extra turn to giving you free dice results. If you land on the Air Attack Base tile, you can choose to use one of the one-time-use vehicles parked there. The air tanker allows you to remove one flame token from three adjacent tiles. You can use the helicopter to remove three flame tokens from one tile. And the brush rig can be used to place three firebreaks in a continuous line. Each tile has a “scorch limit,” which tells you how many flame tokens can go on the tiles before they get scorched (flipped over). When a tile does get scorched, the fire will spread to another tile adjacent to it. Some of the tiles have extra effects when they get scorched, such as spreading the fire a bit more or even making characters lose their special abilities. 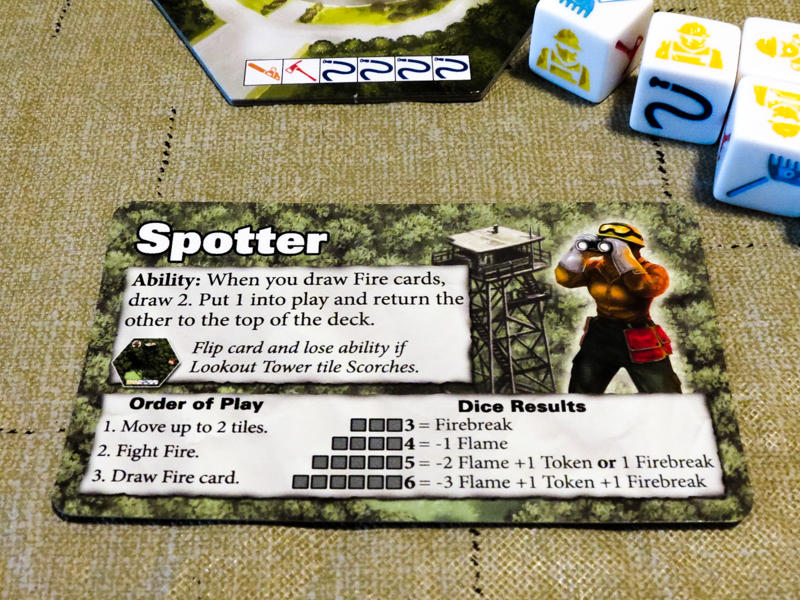 If any firefighters happen to be on a tile when it scorches, you’ll lose that many dice (you can gain them back by ending your turn on the Fire Camp/starting tile). After you’ve moved and fought fires, you’ll draw a fire card. These cards spread the fire in a number of ways. Most of them will tell you to add fire tokens to currently burning tiles, but there are also wind cards that blow the fire to non-burning tiles. Some of the fire cards even change the direction the wind blows. When you draw one of these cards, you’ll turn the wind marker and all future wind cards will blow the fire in that direction. You’ll win the game if you finish a turn with no flame tokens on any tiles. You’ll lose if either the Fire Camp tile gets scorched or 8+ tiles are scorched. Press your luck games aren’t usually my cup of tea, but it just makes sense here. You take chances in hopes of putting out the fire; sometimes it works, sometimes it doesn’t. It definitely creates a lot of “Wahooo!” and “Oh no!! !” moments. The wind marker was a brilliant idea. It’s great that you have to change your strategy up a bit based on where that marker is pointing. It’s also very cool that each of the firefighters has a specific tile that they want to keep from getting scorched. Every special ability is important, so you really don’t want your tile to get flipped. This game looks very nice on the table. 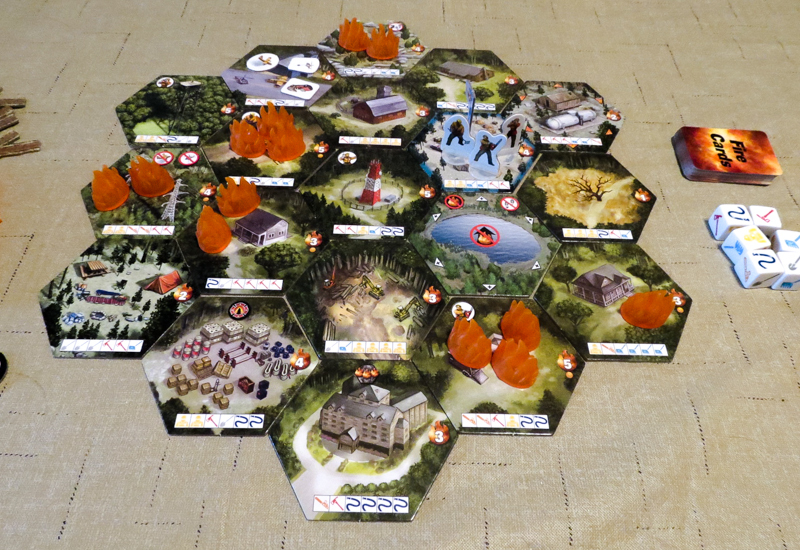 The artwork on the tiles works well, and the flame tokens look and feel great. The rulebook is excellent. Other than having a bit of a tough time memorizing the symbols on the tiles and the reward tokens, I was able to learn the game after one turn through the book. It’s also very easy to teach. Like in other Justin De Witt games, the rulebook includes a long list of ways to make the game easier or more difficult. This is great since it adds to Hotshots’ replayability. Most of our games have been nail-biters, but a few of them were anticlimactic. Sometimes you’ll have five or six scorched tiles lined up in a way that actually helps you, making it much easier to win the game. There are only four firefighter characters in the game, which is a bit of a shame. Having more options would add even more replay value. Maybe there will be more characters (and tiles) in a future expansion? Hotshots definitely rivals Castle Panic (base game) and Star Trek Panic as our favorite game from Fireside Games. It has a good flow to it, it has a theme that just about anyone can get into, and it looks fantastic on the table. Oh, and it usually has some very tense finishes. We’ll be keeping this one since we really like the theme and it’s one of the only good press your luck co-op games out there. Many people are going to wonder if it’s worth it to get Hotshots if they already own Flash Point: Fire Rescue. Yes, it’s totally worth it. The two games do have firefighting and dice rolling in common, but they feel like two very different games. If you enjoy dice rolling/Yahtzee-style games, Hotshots is a must have. If you like the firefighting theme and were looking for a new cooperative family game, definitely check this one out. Thanks for taking the time to read our Hotshots board game review!